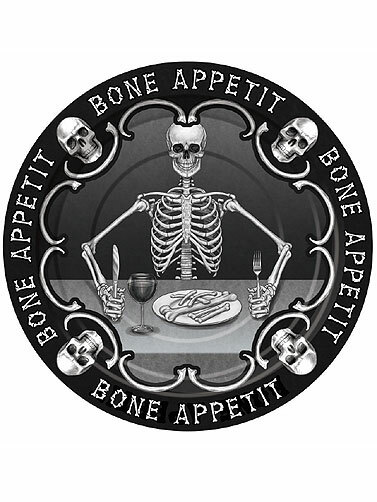 Bone Appetit Dessert Plates are a fun skeleton themed tableware with a play on the phrase Bon appétit. Black paper plates with a monochrome print featuring skeletons and skulls. Dessert size plates are just the right size for serving Halloween party snacks. Matching Bone Appetit decorations and tableware is available. Each sold separately. Bone Appetit Luncheon Plates measure 7" in diameter. 8 ct.